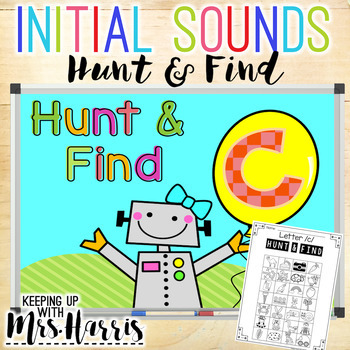 If you have fallen in love with Hunt &Find games, this bundle is perfect for your phonics lessons. 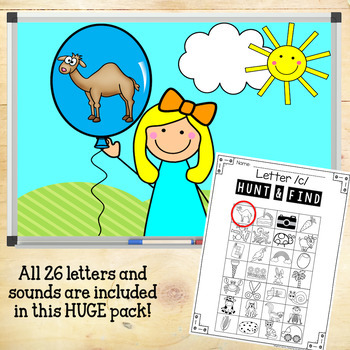 All 26 letters for practicing initial sounds are included in this pack of games. Watch the video in the preview! 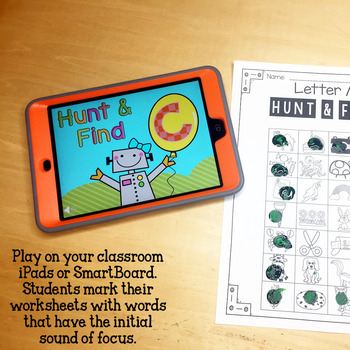 Your students can practice their identification of sounds that match or are different than their focus letter. This self-paced PowerPoint on words with initial sounds can provide endless practice and entertainment for you and your students. Who couldn't use hours of quiet time in your room? Yes! You can get that amount of time to do teacher duties while your students are engaged using this PowerPoint! Prepare by copying the worksheet. Then have students pull out a crayon or highlighter. Press play on the powerpoint and the work is done for you! YAY! This pack includes 26 games! There are 16-28 words per game to provide short and engaging learning opportunities for your students. The slides automatically play either on an active board or you can open the files in PowerPoint's iPad app. Now with sound! That's right! 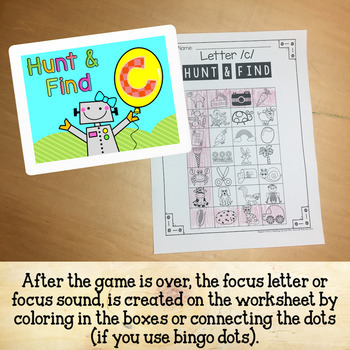 You are no longer needed during Hunt and Find games! Walk away proudly, smile, and give a wave! Students can press the speaker image on each slide to hear the word or directions! Bravo, teacher! You rock! Now go do other teacher duties! Watch the video preview to see how you can play on the active board or projector.Love this product? BEST IDEA EVER! SAVE WITH BUNDLES! © 2017 KEEPING UP WITH MRS HARRIS PRODUCTS. This purchase is for you and your classroom. Duplication for an entire school, an entire school system, or for commercial purposes is strictly forbidden. Please have other teachers purchase their own copy. If you are a school or district interested in purchasing several licenses, please contact me for a district-wide quote.